Written by CMOS Bulletin SCMO on March 14, 2018 . Posted in News & Events, Weather. The Patterson Medal Award is given for distinguished service to meteorology in Canada. The medal was established in 1946 in honour of Dr. John Patterson, Controller of the Meteorological Service of Canada from 1929 to 1946. The Patterson Medal Award Committee is seeking nominations for the 2017 recipient of this award. 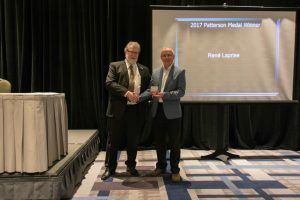 David Grimes presents René Laprise (left) with the 2016 Patterson Medal Award at the CMOS Congress in Toronto, June 2017. The Committee emphasizes that the award is one for which all people engaged in meteorology in Canada, whether at the technical or professional level, may be nominated. The Committee will choose the nominee who, in its judgement, is most worthy to receive the award. Three members of the Committee are appointed from the Meteorological Service of Canada plus one from a Canadian university and one from a scientific or industrial organization. For more information see the full Call Letter which includes a list of past recipients, the Instructions to Nominators and the Nomination Form. Please note (as indicated in Part A of the Instructions) that the decision of the Committee is based solely on material submitted by the nominator and not on information available from other sources, such as personal acquaintance. Should you require additional information, please contact JoAnn Demers by email at JoAnn.Demers@Canada.ca or by telephone at 819-938-4387. Return the nomination, with supporting material, to the address given on the Nomination Form, no later than March 26, 2018.